This post has been sponsored by Prairie Farms. All thoughts and opinions are my own. The biggest game of the year is around the corner and I can’t wait to share one of my favorite recipes with you! When it comes to tailgates and football parties, I’m all about the food. While I do like watching the game, my interest is usually on the snack and appetizer table. 😂 What can I say, this girl likes to eat! 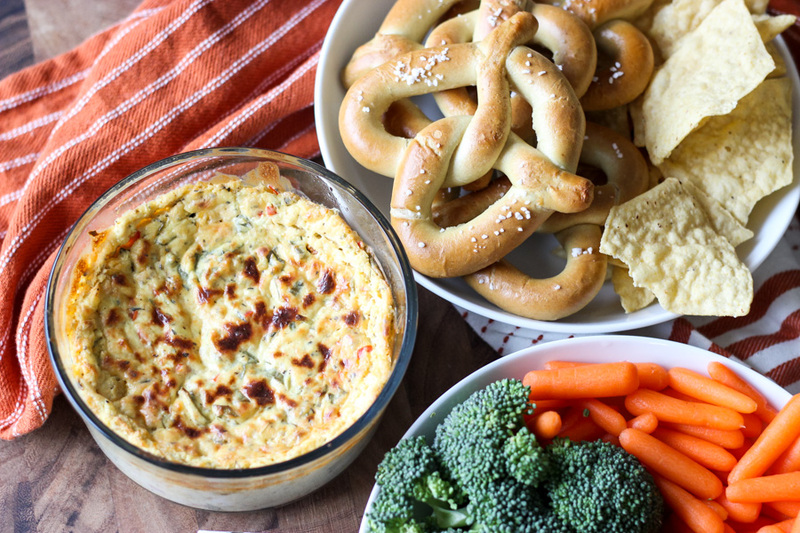 When it comes to dips and appetizers, gimme all the cheese! 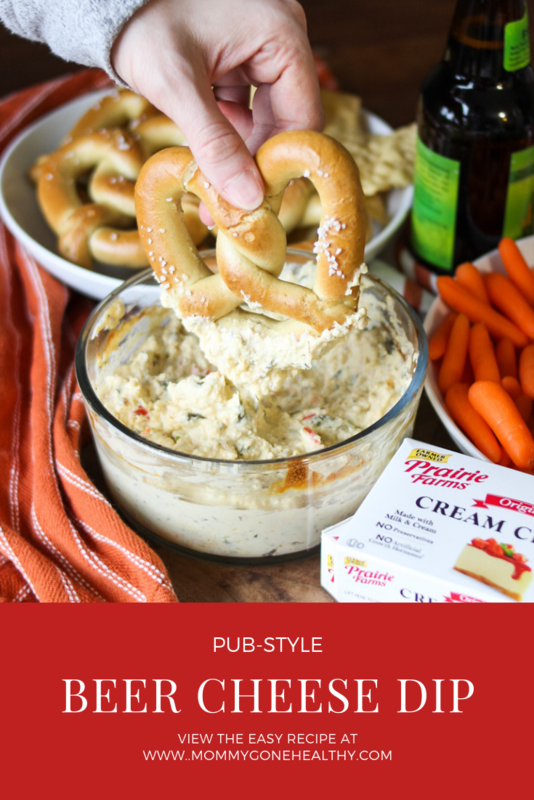 One of my favorite dishes to whip up in a flash for our game day menu is this pub-style beer cheese dip! 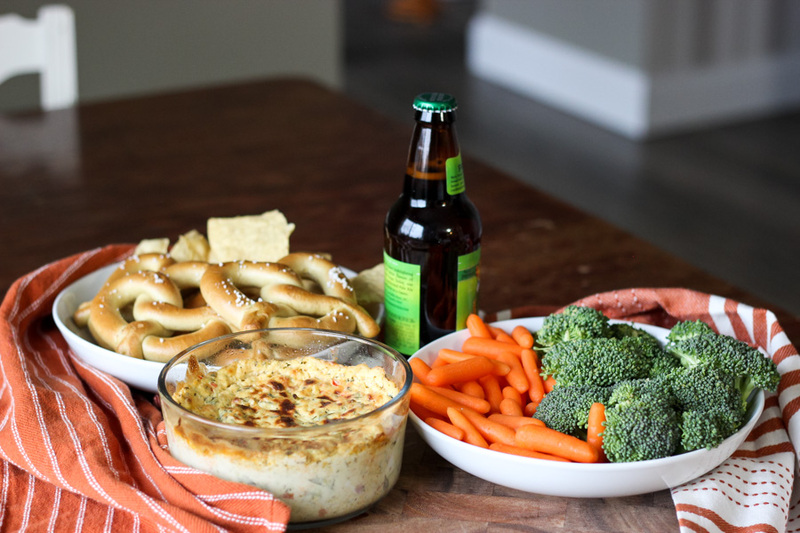 This recipe for beer cheese dip is loaded with so many delicious flavors that come together so deliciously to make you “ooo” and “ahh” in delight. With lots of simple ingredients and a medley of 3 delicious cheese (cream cheese, smoked gouda and cheddar), it takes under 10 minutes to mix up and then you pop it in the oven to bake for another 30 minutes. 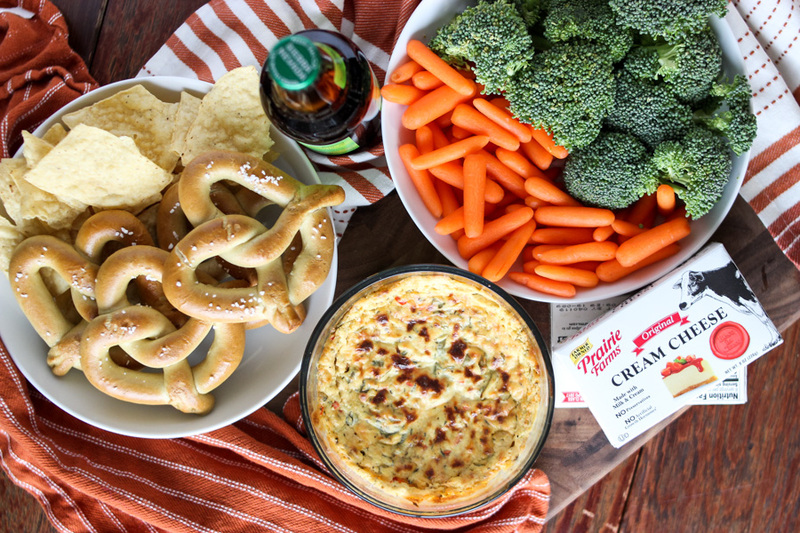 This pub dip favorite is best served with pretzel bites, tortilla chips and veggies so you have lots of dipping options. Also, if you have leftovers (which to be honest, isn’t very unlikely – ha! ), this dip is pretty darn good cold too. 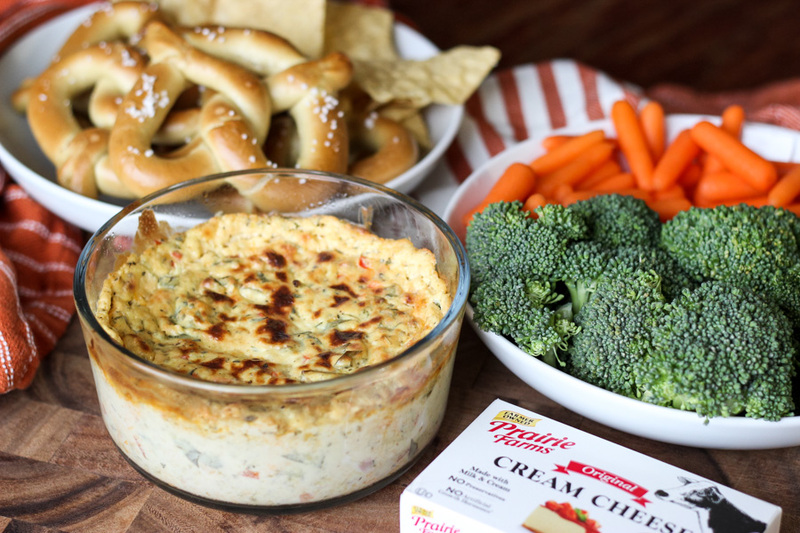 The secret to this dip is quality cheese and choosing the right beer based on the flavor that you desire! 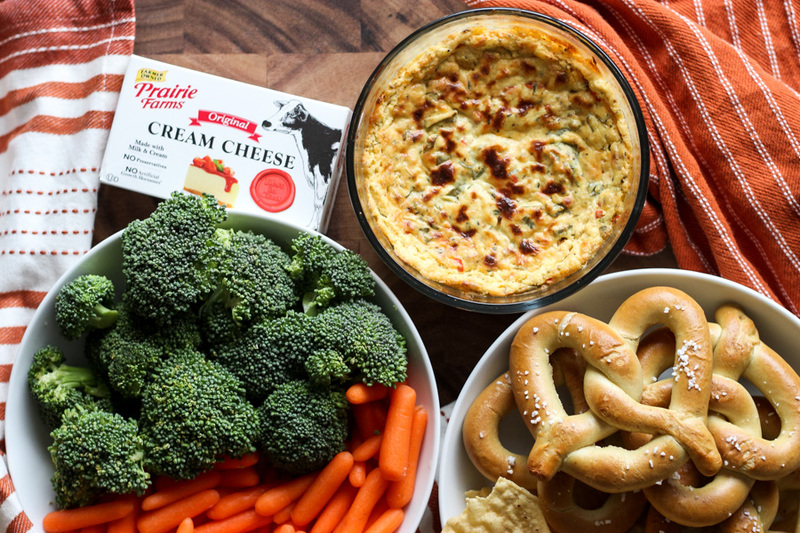 When it comes to cream cheese, Prairie Farms is my go to! Their cream cheese only contains a handful of ingredients with no preservatives or artificial growth hormones (hooray!). 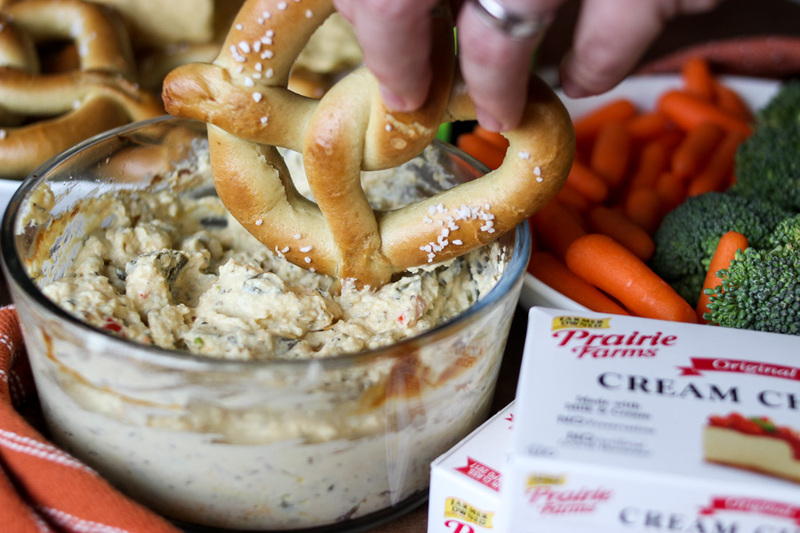 The addition of Prairie Farms cream cheese, gives the dip a creamy goodness that can’t be beat. 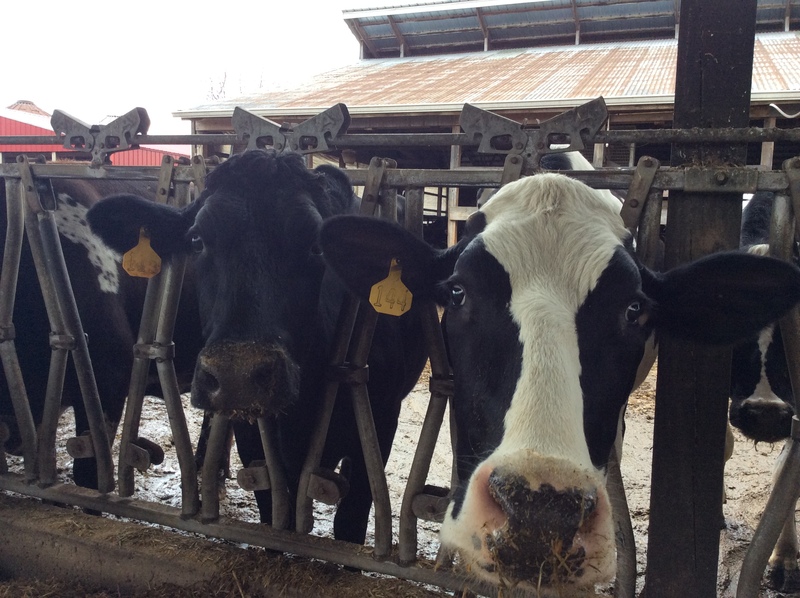 Another bonus to using Prairie Farms: you help support local dairy farmers through purchasing their products! Prairie Farms is comprised of over 800 family farms in the Midwest. These farms families have passed down their expertise for years and continuously give back to the community through supporting the local businesses, schools and churches in rural America. 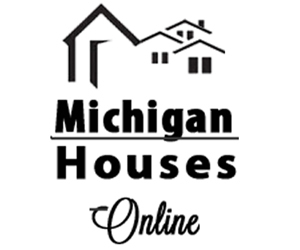 I’ve grown up with rural farm towns around us and these farms are truly the center of some of these smaller towns. When the farms suffer, the whole community suffers through lack of jobs and loss of income for these small communities. The farms success is integral to continuing to allow these communities to thrive and grow. 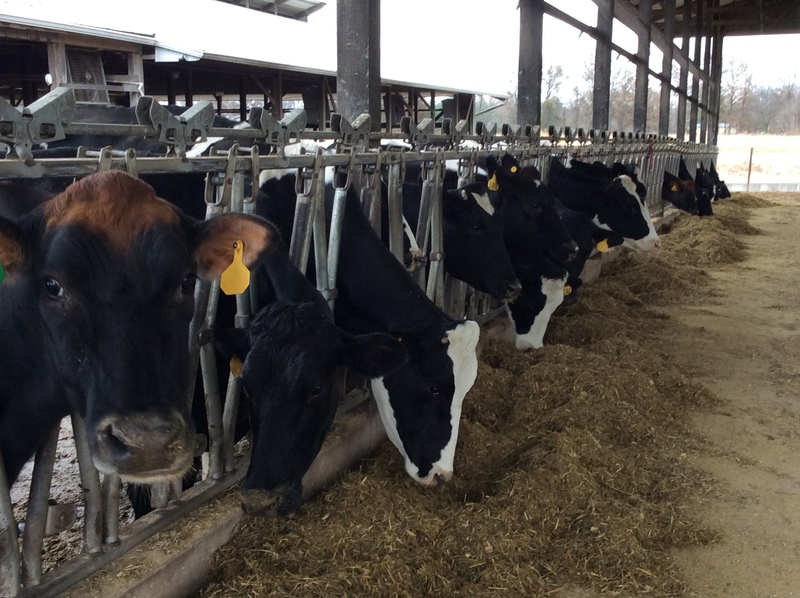 When you’re shopping for your groceries and game day supplies, keep in mind the local dairy farms that you are supporting and that in return help support their towns. 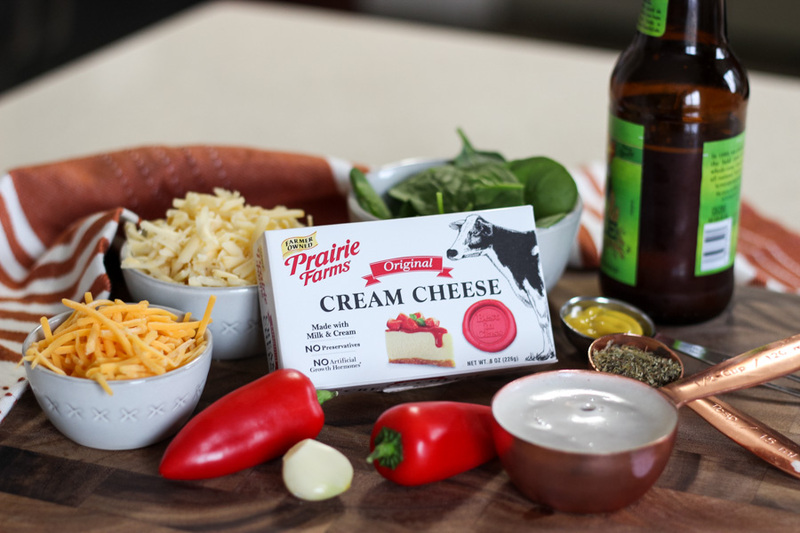 When you buy Prairie Farms dairy products you help support local dairy farmers and their neighbors and buy the best dairy products for your own family and friends to enjoy too! 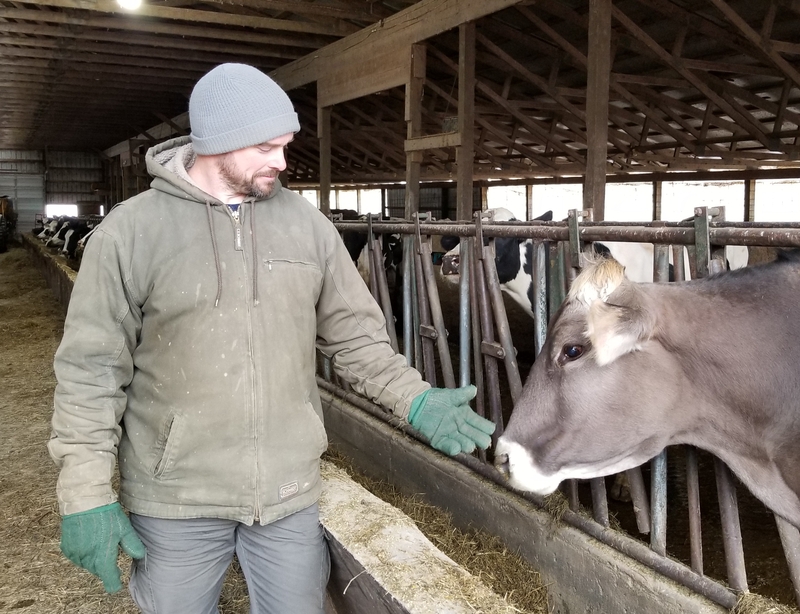 Read more below to learn about the awesome MOOvement campaign they have going on right now that’s giving hundreds of prizes away for those supporting local dairy farmers and their families. Like I said earlier, high quality cheese is a must! I like using a smoky gouda to give the dip an extra depth and the smoky flavor really stands out in this dish too. I like to add some red pepper and spinach to add extra flavor, but if you don’t care for those veggies you can omit them (the red pepper really adds some goodness to this dish though). As for the beer, the type of beer you use can make a difference when it comes to flavor undertones. For today’s dip, I used an IPA, but you could easily substitute a lager or ale which will have some variation in flavor. As long as you stick to a quality beer and not something that is overly sweet or flavored, it should turn out great! This creamy and addictively good cheese dip is perfect for serving at football games, parties or just a night in with family and friends! 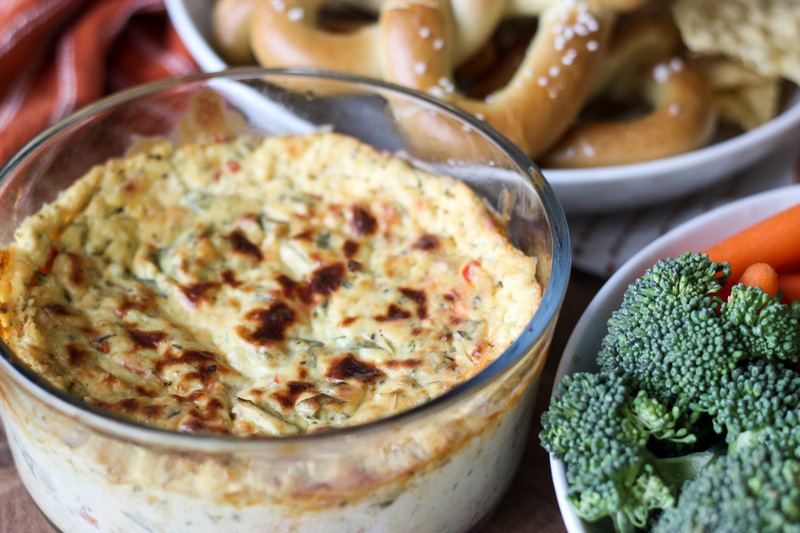 A medley of delicious cheesy goodness and undertones of lager, make this dip perfect to serve with pretzels, tortilla chips or veggies. Preheat oven to 375º. Mix all ingredients well and place in oven safe bowl. Optional: Broil for crunchy, browned top. Serve with pretzels, tortilla chips, or veggies. Be sure to join Prairie Farms Gameday MOOvement campaign! 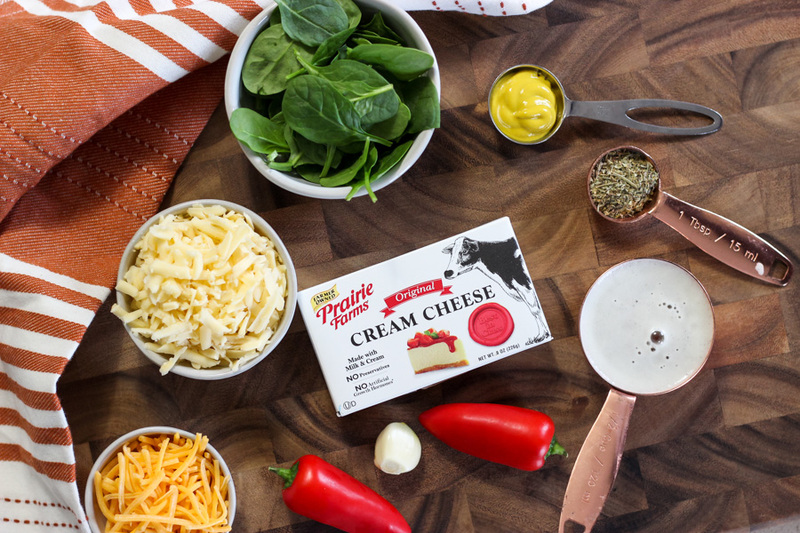 With the MOOvement campaign, Prairie Farms is encouraging YOU to pledge to help local dairy families by purchasing Prairies Farms products and to help encourage others to join the MOOvement as well! Those that pledge their support to the MOOvement campaign, will be automatically entered to win one of our daily prizes (100 daily winners) as well as a grand prize drawing on Jan 31st. Are you watching the Super Bowl? What’s your favorite game day dish? Oh man this looks soooo good…perfect for the big game! Hmmmm I’m drooling! This looks so yummy! Can’t wait to try this at home. That dip looks PERFECT for game day! I can definitely get on board with this dip! Beer and cheese, yes please!